If you’re considering working with a strategic alliance partner to develop an account-based marketing (ABM) plan for one of your key accounts or target clients—or for a cluster of accounts—there are several things to think about before you get started. The model we present here will help you plan and then execute mutually beneficial ABM programs in conjunction with your partners. We know that ABM success depends on laying down strong foundations in terms of program objectives, resource decisions, process and system support, governance models, and metrics. But there are some additional issues to work through when planning ABM with partners. If you have a strategic partnership already in place, it’s likely that you will have some joint objectives for your relationships and a clear idea of the benefits your alliance brings to each company. But don’t assume that your objectives for each specific account are aligned; take time to align them. Every ABM initiative needs some form of governance. Like any project, the sponsors, steering group, and working group all need to be identified. Project scope, objectives, timelines, and milestones also need to be agreed on, along with the measures of success and how these will be tracked and reported among all interested parties. Even in the most balanced alliances, there is often one company that is a natural choice for taking the lead in the ABM initiative on a specific account, perhaps because of the nature of the opportunity, its historic business with the account, or the strength and seniority of existing relationships in that account. The best ABM initiatives have dedicated people (full or part time) and agreed-upon processes that link with related processes across the company, such as account management processes. They are supported by systems that deliver insight on the accounts, engage the accounts with digital content, and track online and offline engagements so that everyone has full knowledge of client interactions and can report on progress. Get agreement on how you will work together first before starting your ABM program. The quickest way to kill your joint ABM initiative is to fail to align the compensation models of your sales and account management teams to the joint objectives. Compensation models drive behavior; be willing to create a new model for those involved in both companies. 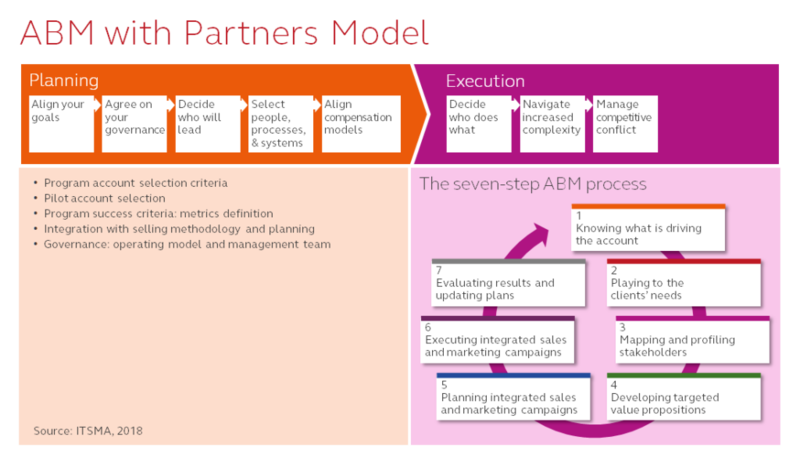 ITSMA’s seven-step ABM model applies just as well to ABM with partners, but there are some extra things to consider in order to maximize your chances of success. ITSMA research shows that not all members of an account team are always clear on the role they will play in an ABM initiative. This confusion can be further complicated when teams from two organizations are involved, so be sure everyone involved is clear in their own mind what is expected of them and what they can expect from each other. It’s difficult enough aligning your own internal teams for an ABM initiative, but even more complex in partner ABM. Map out the audience groups and the stakeholders you need to involve or keep informed in both companies as you progress with your plans. You may find that you and your partner overlap in some capabilities and competencies and are effectively competitors in some lines of business or sectors. So, take the time to map out potential areas of competition or conflict, and agree on what action to take should a situation like the example occur. In the right context, doing ABM with a partner can deliver an even broader range of benefits than if you had run your own ABM initiative independently, including more brand power and resources, a greater ability to meet the needs of the client, joint innovation, and the development of best practices that both can benefit from. In addition, your client also benefits from more relevant solutions, combined to meet their needs, a more seamless experience from its suppliers, and ultimately, better business outcomes. In conclusion, when you create a strategy for ABM partnerships, you, your partner, and your client reap the rewards. A special thanks to the ITSMA ABM Council for sharing its experience and advice on this topic. For the complete tool, see ABM with Partners. This document is available at no charge to ITSMA members (password required) and for sale to everyone else.